Steamed mussels have always been a favorite of mine but I wasn’t sure how to cook them when I started the Dukan Diet since I couldn’t use the beer or white wine I normally steamed them in. 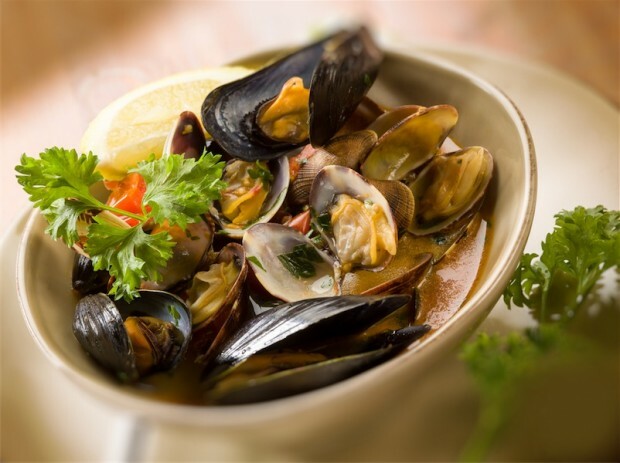 However you can get very similar flavors by infusing chicken broth with tomatoes, parsley, lemon juice, and onion and quickly steam mussels in just about 5 minutes. 1. In the bottom of a large pot add the onion, parsley, lemon, tomato, and chicken broth. 2. Bring to simmer and let simmer for 5 minutes. 3. Add the mussels and clams to the pot and cover. Cook for 5 minutes or until the mussels and clams open up.